Cuomo officially announced the deployment of a new Gang Violence Prevention Unit, consisting of ten highly-trained State Troopers, to several Suffolk schools that have been identified as centers of gang activity, including violence, drugs, and recruitment of new members from the youth that attend them. 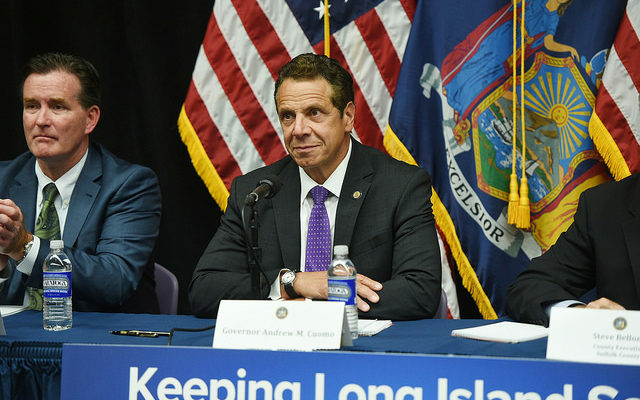 The new unit, Cuomo noted, will make stopping gang-related violence before it ever happens its top priority by employing their skills and experience working on the streets to recognize the precursors of such activity. Ten schools in six school districts have been selected to encompass the scope of the new Unit’s activities: Brentwood, Central Islip, Huntington, Longwood, South Country Central and Wyandanch. In addition, the Gang Violence Prevention Unit will work hand-in-hand with the Suffolk County Police Department to help teachers staff, and parents in key areas to learn and take note of the warning signs of gang activity, which include withdrawing from family, not showing up for school, keeping secrets, or breaking the rules. The program, dubbed “Educate the Educators,” will provide resources to administrators, counselors, principals and teachers in an all-out effort to help prevent youth under their care from venturing down the path to ruin with gangs such as MS-13. The announcement of stepped-up efforts against gangs on Long Island – especially MS-13 – comes on the heels of a recent visit by President Donald Trump to Brentwood, where he condemned the hateful violence and lawlessness of gangs in Suffolk and Nassau in no uncertain terms, vowing to “destroy” MS-13 and their ilk while speaking to gathered members of law enforcement at the Michael J. Grant Campus of Suffolk County Community College in late July. In addition to various preventative measures implemented against gang activity and educating school staff in an effort to keep the youth under their care on the straight-and-narrow, Governor Cuomo’s Gang Violence Prevention Unit will also speak directly to the most vulnerable in the communities they will be servicing- the kids themselves. Curriculum is slated to be introduced that will target those who are most at-risk for indoctrination into the gang lifestyle, with the intent to instill the wherewithal in students to either avoid bad influences or leave them behind if already within their clutches. The goal is to establish a relationship of trust between police and youngsters that can hopefully be used to install the proper values in them; with violence in parts of Suffolk reaching a fever pitch – in the last 18 months, MS-13 has been responsible for 17 murders, according to the Suffolk County Police Department – the time for such preemptive action on the part of law enforcement is clearly now. The action announced this week comes after Cuomo’s previous decree in April that saw 25 State Troopers deployed in Suffolk to conduct high-profile patrols in highly gang-afflicted areas such as Brentwood and Central Islip in addition to covert undercover operations of known street criminal groups. Suffolk County Executive Steve Bellone hailed the efforts of both the SCPD and Governor Cuomo’s Gang Violence Prevention Unit, and said that working in consort with them both would ensure that the scourge of MS-13 and similar bloodthirsty purveyors of injustice would soon be wiped from the face of Long Island.